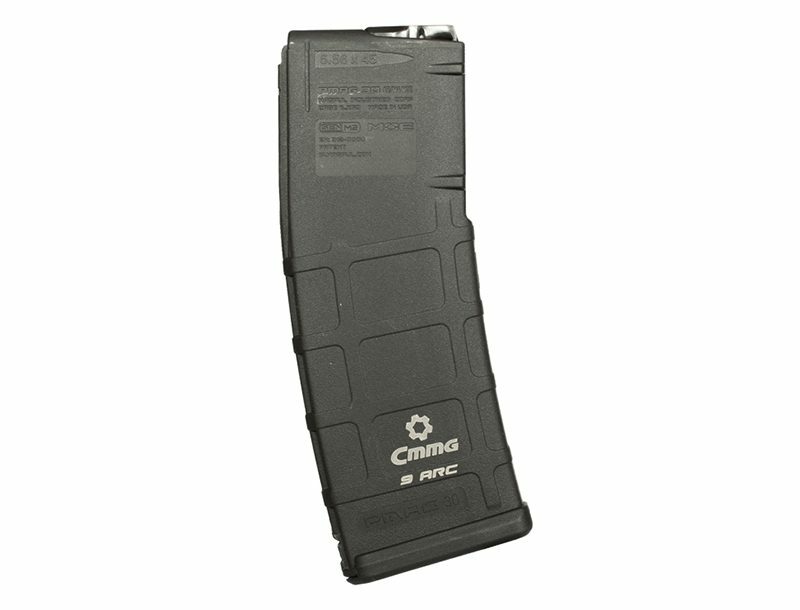 The Glock 17 & Glock 19 Gen4 MOS are destined to become popular fixtures in the company’s lineup. Glock’s new G17 Gen4 MOS (left, with Leupold DeltaPoint) and G19 Gen4 MOS (far left, with Dead Ringer Snake Eyes sights) are fast 9mms ready to hit multiple targets with ease. 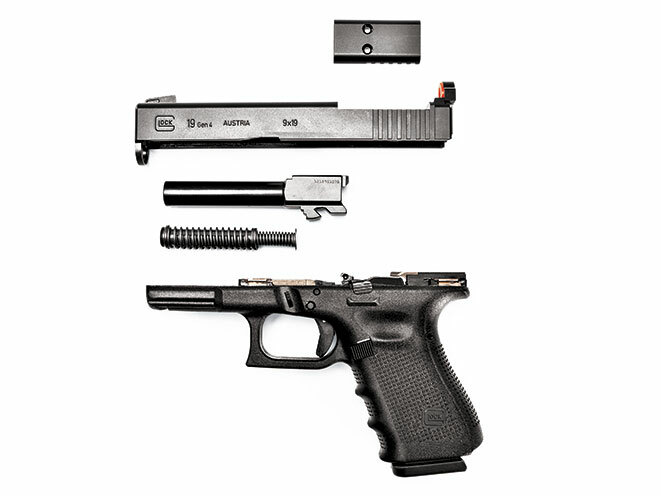 While Glock’s first MOS pistols were long- slide models built for competition and hunting, the G17 Gen4 MOS is ready for everyday carry with its 4.49-inch barrel. 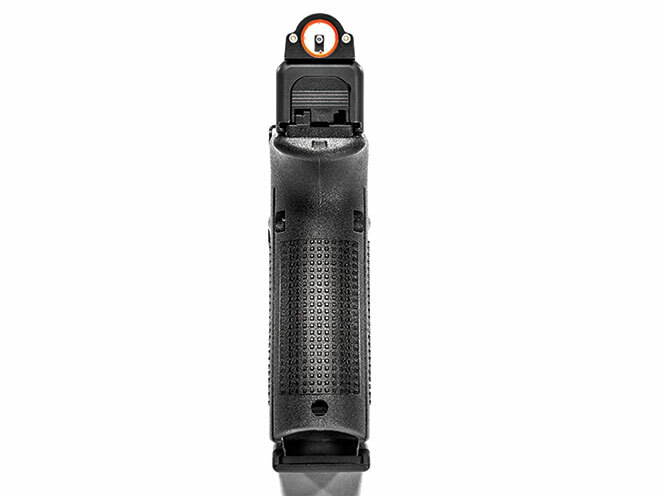 Glock offers six reflex sight adapter plates that make it easy to add today’s most popular reflex sights to the pre-cut mounting bracket on the MOS slide. 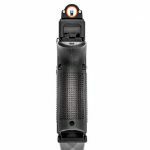 Dead Ringer’s Snake Eyes sights consist of a large rear aperture with a bright orange circle for quickly centering the large tritium front sight. Like all Glock pistols, the new MOS models are easy to take down for cleaning and maintenance. 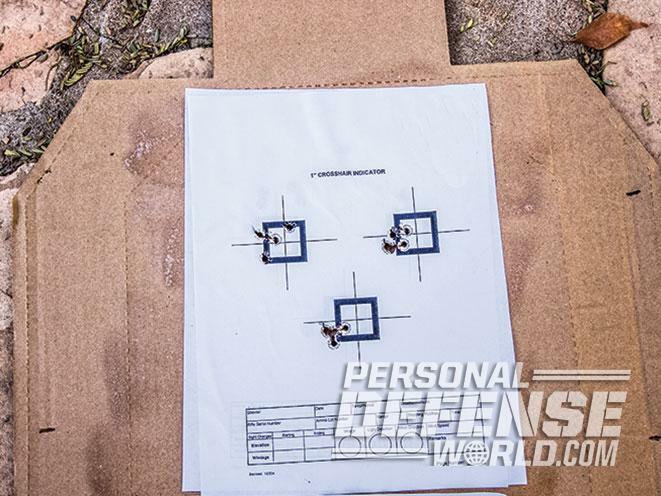 As you can see, both of the Glock MOS pistols produced tight five-shot groups at the range. In our world, there are a few events that seem to deliver annual points of anticipation. Who will make it to the Super Bowl? When will the first snow fall? And, of course, what will Glock be releasing this year? Once again, the company did not disappoint. 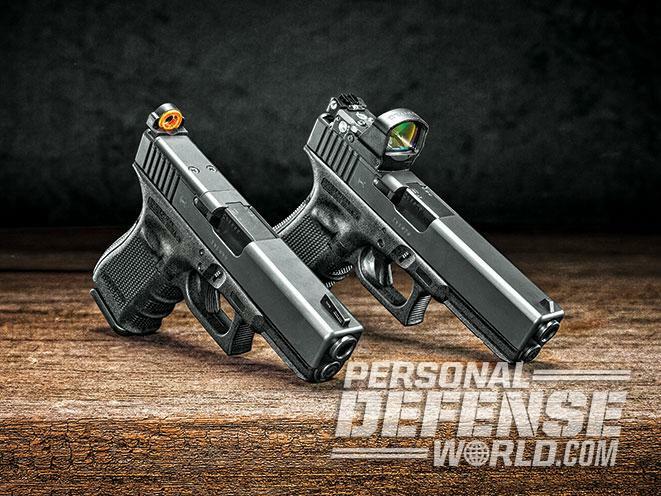 The latest addition to its lineup is the G17 Gen4 MOS and the G19 Gen4 MOS. 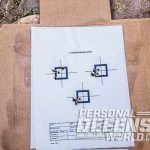 An expansion of Glock’s Modular Optic System (MOS) line, these guns are destined to become popular fixtures in the company’s lineup. 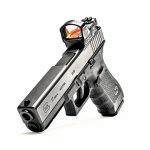 The MOS system is designed to allow for the simple mounting of popular pistol optics without the expense of machining the slide. Glock has done the work for us already, and with exceptional precision. MOS Configuration pistols are offered with a cover plate for when no optic is mounted, and four different plate options to comply with the specifications of some of the most trusted optic manufacturers in the industry, including EOTech, Docter, Insight, Meopta, Trijicon, C-MORE and Leupold. It should be noted that optics are not included with the purchase of the pistol. 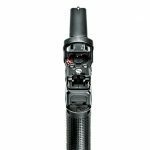 The position of the new cutout also gives you the option of adding tall iron sights that allow the optic and iron sights to co-witness, providing backup in the case of optic failure. 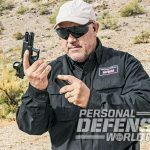 The use of optics on pistols has been popular with competition shooters for years, and has become increasingly popular for concealed carry and home defense. 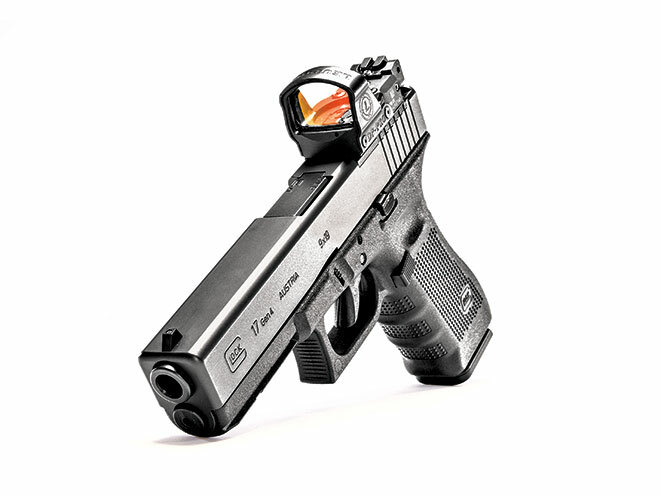 Red-dot-style optics offer shooters greater speed and clarity in their shooting. The ability to shoot with both eyes open has enormous benefits in defensive situations, as it allows greater awareness of what is beyond the barrel. 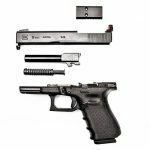 The new Glock MOS Configuration and a modern optic are a strong pairing for tactical use, defense or competition. In many people’s minds, it was the G17 that really started Glock down the path that led to the MOS system. Countless Glock 17s have been brought to machine shops over the years, cutting into the slide to allow for popular red-dot optics; or people used out-of-the-box versions that utilized the rear sight channel. Glock has taken the lead and provided customers the opportunity to get their classic and reliable G17 in the sought-after MOS Configuration. The modification of the slide changes nothing in regards to the standard function of the gun. It is still the reliable go-to gun that people love. 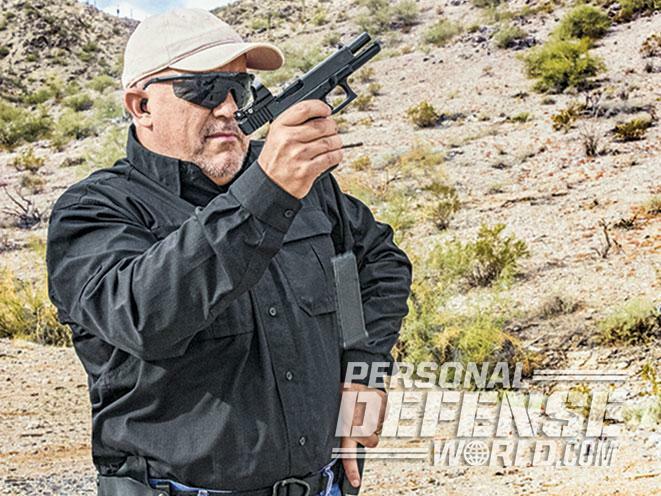 While it may be hard to believe, the Glock 17 just got better. To many, the release of the new G17 Gen4 in MOS is seen as a major development. However, Glock did not stop there. In concert with the new G17, Glock has also released the Glock 19 Gen4 in MOS. 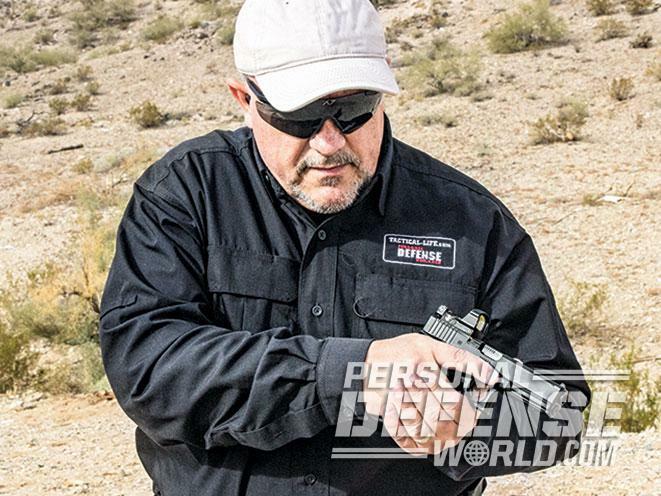 This move shines a light on the growing trend to keep red-dot optics on defensive pistols. 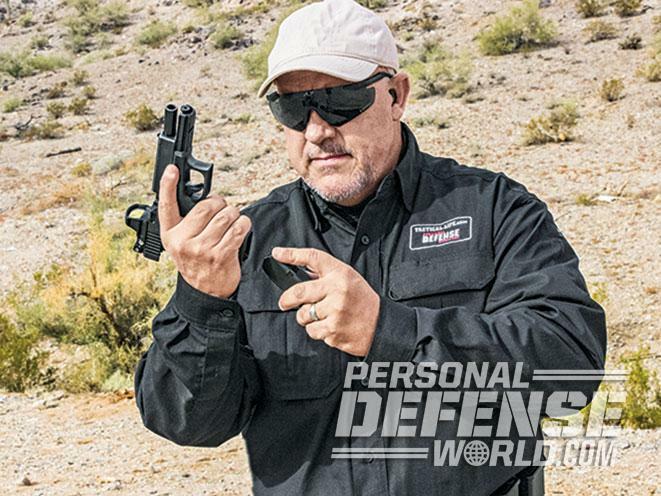 Once the exclusive realm of the competition world, red dots have made their way onto defensive carry guns. The leader in this field is the Glock 19 Gen4. 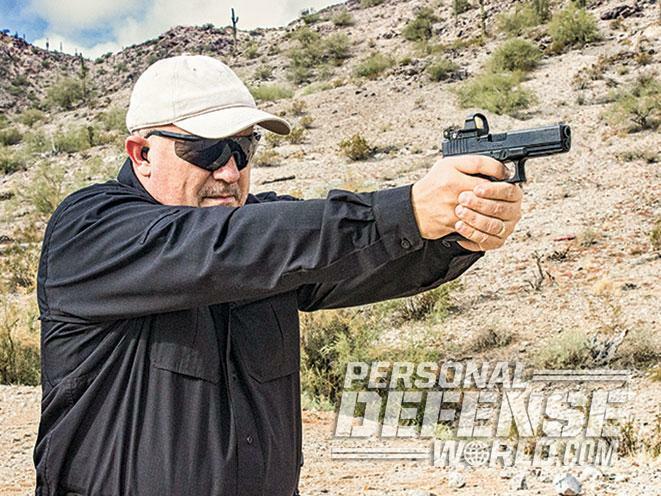 The G19 is undeniably one of the most popular CCW pistols in the world. It offers a great balance between capacity and size. 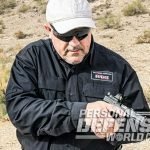 The ability to add a red-dot-style optic to this weapon will allow shooters greater accuracy and speed should they ever be forced to defend themselves. While platitudes and accolades are nice, with firearms it will always come down to performance. For our range session, we would use the Leupold DeltaPoint Pro. Mounting the optic was as easy as advertised. With one simple tool, we removed the cover plate, added the appropriate mounting plate and dropped on the optic. The optic’s fit was perfectly snug and clean with both pistols. As a tip of the hat to Glock’s reliability, we would shoot standard 9mm 115-grain ball ammunition from Patriot Munitions. The major reason behind this is that most people will be shooting inexpensive ammunition during training. After a brief zeroing session, we began to put the Glocks through their paces. First up would be shooting groups at 25 yards. This was an off-hand, slow-fire process with the goal of getting the best group possible. Both the G17 and G19 shot extremely good groups. Both produced groups under 1 inch, which is impressive for any gun right out of the box. A special note here regarding the G19. While it is a fact that the G19’s barrel is 0.47 inches shorter than the G17, it still performs on par with its larger brother. 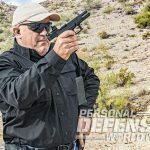 The current trend has been to focus on extended barrels for superior accuracy, but this does not apply to general defensive handguns. 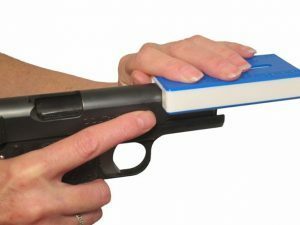 While long-slide guns are indeed incredibly accurate, they are tough to conceal. The G19 Gen4 MOS and G17 Gen4 MOS will provide exceptional, repeatable accuracy in any defensive situation. Next, we ran drills incorporating a draw as well as moving from target to target. While acquiring the dot in an optic is slightly different than standard sights, it became second nature in short order. The ability to shoot with both eyes open made transitioning to a second and third target fast and accurate. All the while, the guns maintained the same comfortable and reliable feel of the Glocks that have come before it. 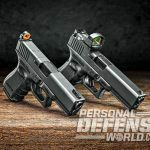 The triggers broke at a crisp 5.5 pounds, and the smooth recoil of these low-bore-axis guns made follow-up shots a breeze to control. These new versions of the G17 and G19 were fast, accurate and a pleasure to run. After burning through significantly more ammunition than we should have, we decided to go “old school” with the Glock 19 and run it with iron sights. 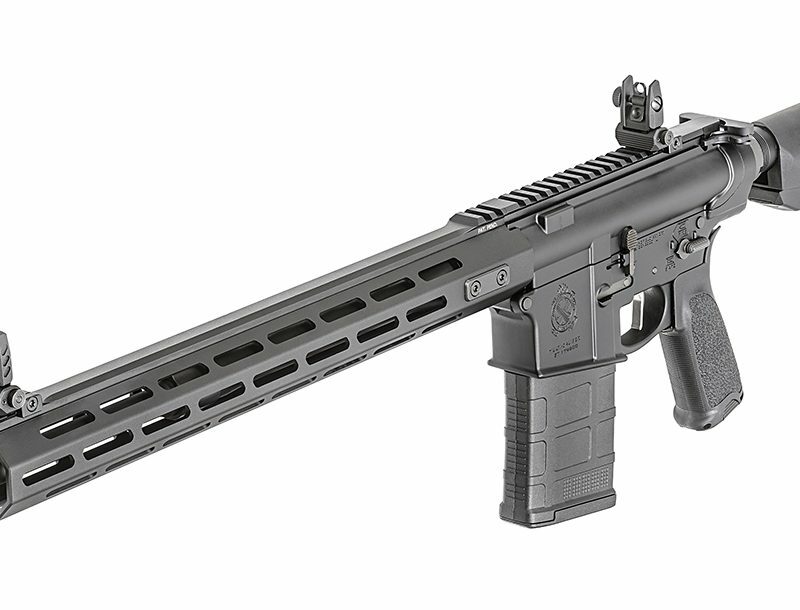 We chose the Dead Ringer Snake Eyes SP series for this experiment. The decision to shoot with iron sights only proved to further solidify Glocks’ reputation for being fantastic guns. The Dead Ringer sights were easy to acquire. Groups with the Snake Eyes sights rivaled those shot with the red dots. As sights go, they are some of the best on the market and a great addition to the new Glock pistols. At the same time as we changed sights, we felt it would be good to run some defensive ammo through both the G17 Gen4 MOS and G19 Gen 4 MOS, just to confirm they still performed well. We would run two brands of personal defense ammo—Federal Personal Defense 135-grain HydraShok and Speer Gold Dot 147-grain GDHP Personal Protection. In both pistols, these rounds fed reliably and proved to still be very accurate. While some guns can be finicky about what they will cycle, Glocks have never been this way, and the company’s new additions follow that same path. Even after decades of unparalleled success, Glock still continues to focus on innovation. 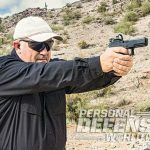 The G17 Gen4 MOS and the G19 Gen4 MOS pistols are a testament to that dedication, and the shooting world is the beneficiary. Glock has once again given us reason to head to the gun shop to acquire a new addition to our collection.